I have a new favorite dinner. 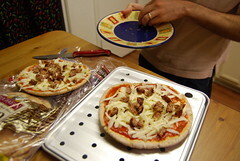 I call it Pita Pizzas and they’re super easy to make. And they’re healthy! 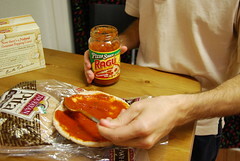 First you take the pita bread and put pizza sauce on top. I bought the kind in a jar, but you can probably make your own sauce from scratch. 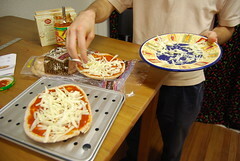 Sprinkle shredded mozzarella cheese on top.